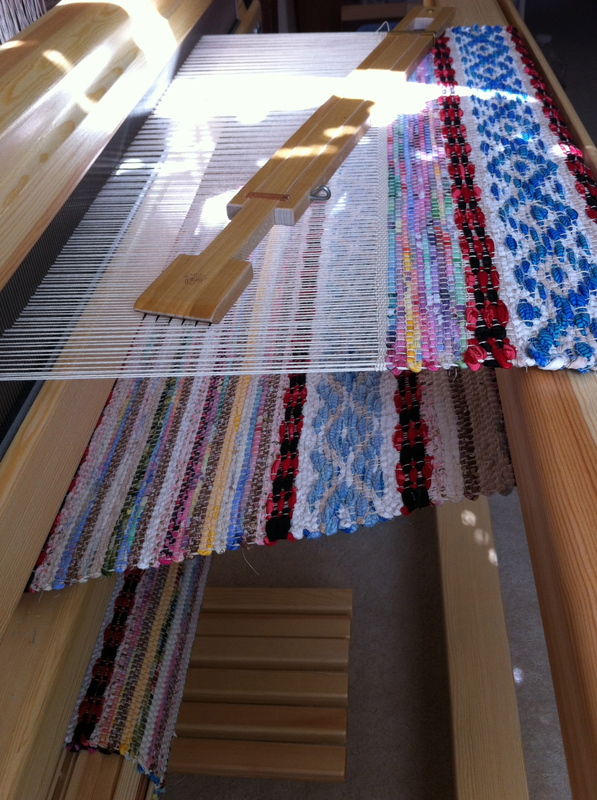 After the warp is wound onto the back beam, I prepare to thread the heddles. By counting the warp ends into measured groups, I am much more likely to prevent a threading error. If I miss a heddle, I catch it after only 24 ends, instead of after threading all 424 ends. Now, if only I would measure my words before I speak, I could prevent errors in what I say, too. Blue linen shimmers on the back beam, with loosely-tied overhand knots holding groups of warp ends. Of course, you wouldn’t literally count your words before speaking, but thinking before speaking is always a good idea. When we rush to say what’s on our mind, our safeguards are gone. And spoken errors are a lot harder to fix than threading errors. Wisdom protects your words. It means not saying everything you think. Wisdom is a filter that makes your thoughts presentable, so you can speak in a way that does no harm, and only good. When we stop and count the cost of our spoken words, before they leave our mouths, we have the beginning of a good conversation, a healthy dialog, or even a worthwhile disagreement. Oh, the interesting cloth we weave with our words! May you speak wise words at just the right moment. My grandmother believed in wearing clothing until it wore out; and even then, she would darn thin areas inconspicuously, to make something last longer. So, it made perfect sense for her to turn scraps of dresses into quilts, and anything that was left could go to the lady across town who made rag rugs. Fortunately, I have a few of Grandma’s hand-sewn quilts, and two of those memory-filled rag rugs. 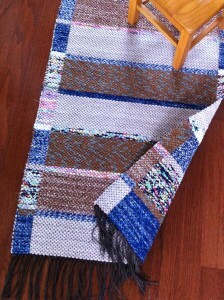 As I weave new rag rugs, I think of the stories woven into her old rugs. 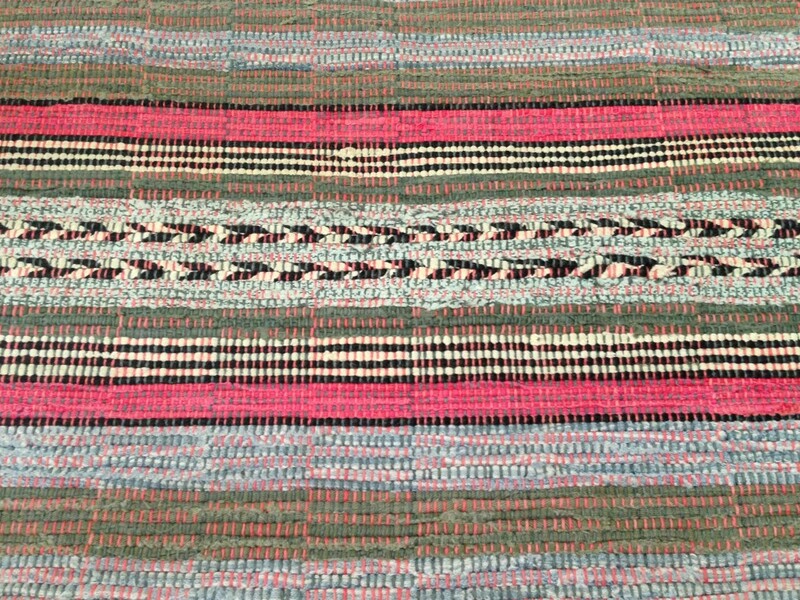 This old rag rug is made of clothing fabrics that are very similar to those in this quilt my grandmother hand-stitched. This old rug is right beside my big loom. I like to imagine that the green denim in this rug was my grandfather’s worn out overalls he wore on the farm. Close-up view shows the interesting pattern in the rug. In contrast to the muted tones of my grandmother’s rugs, the new cotton fabrics I used in these rosepath rag rugs are colorful and bright. Twill rag rug in the making. 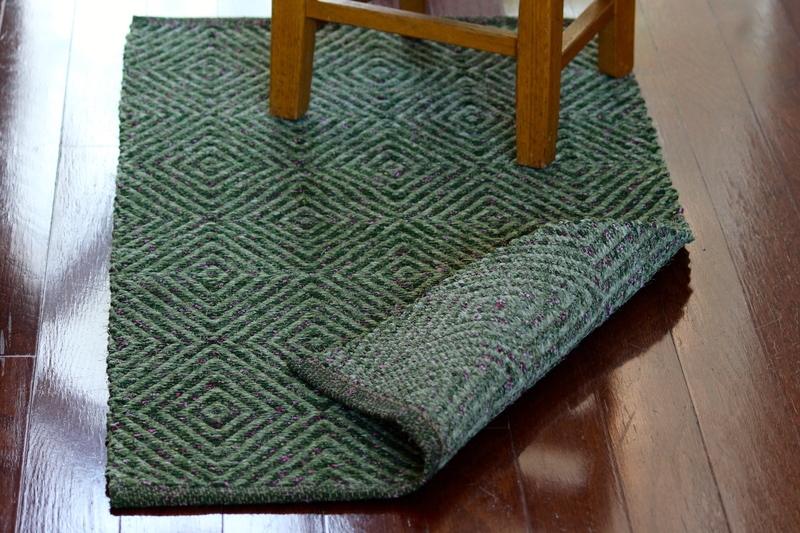 Sturdy rug, perfect for the entry hall. This is our “Welcome to our home” rug. 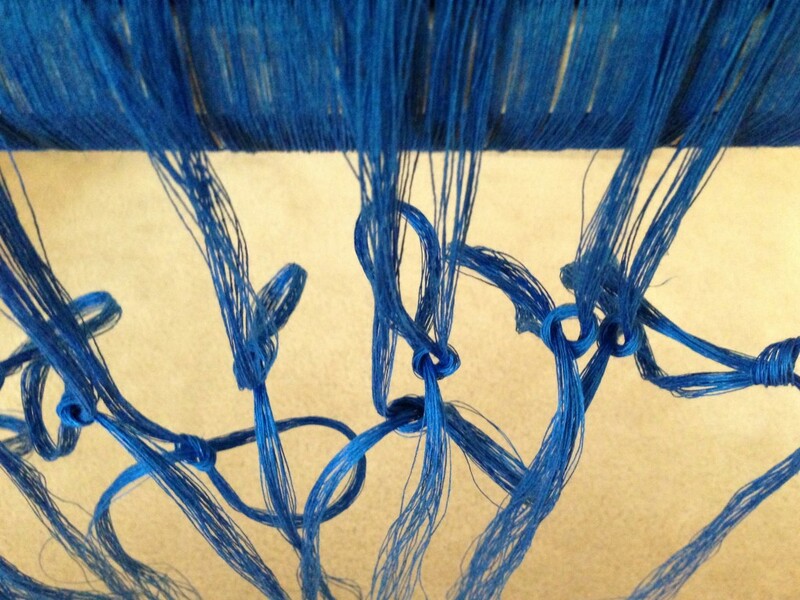 The treadling pattern in this diamond twill rag rug took full concentration. 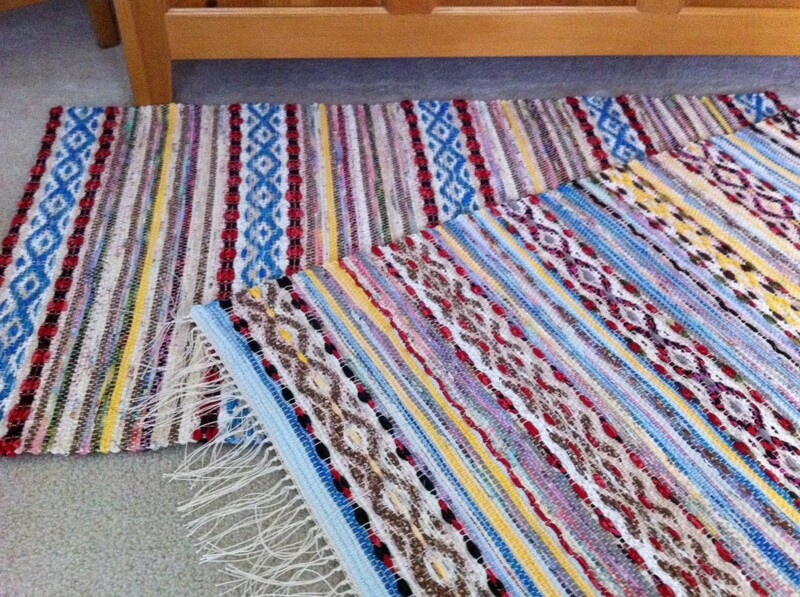 I did a fair amount of “unweaving” and do-it-over’s with this rug. Perhaps someday a grandchild of mine will put this rug in a special place and wonder about the stories woven into it. May you find something old and something new; ponder stories of the past and make new stories yourself. 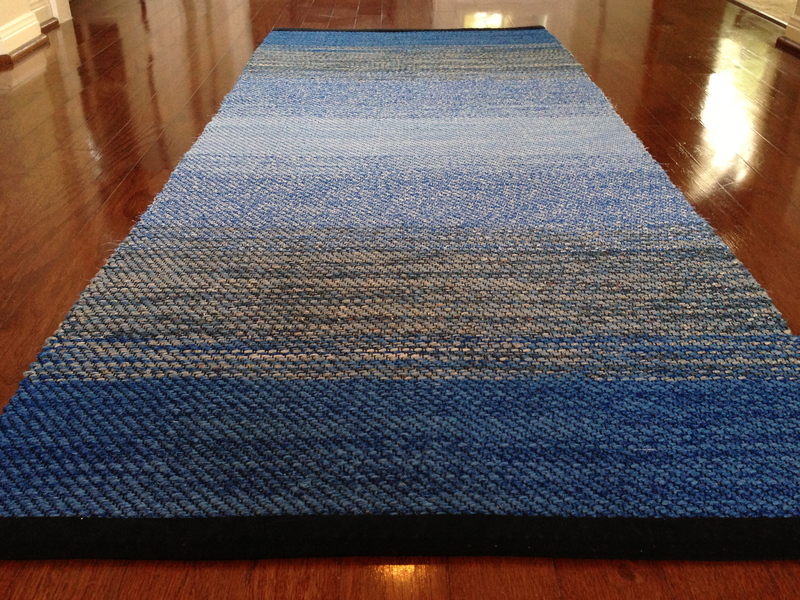 I wove these rugs on my 47″ (120cm) Glimakra Standard countermarch loom. 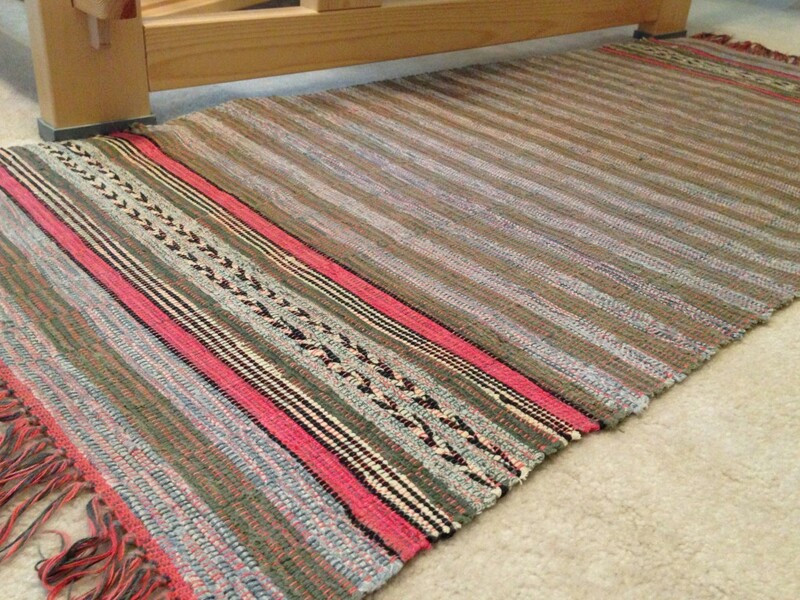 I wish I knew what kind of loom was used to weave my grandmother’s rugs (the first three pictures). Yes, all very nice, I didn’t know I liked rosepath rugs til now. A counterbalance is perfect for rosepath rugs! I do hope you try it. I’d love for you to send me a picture when you do! 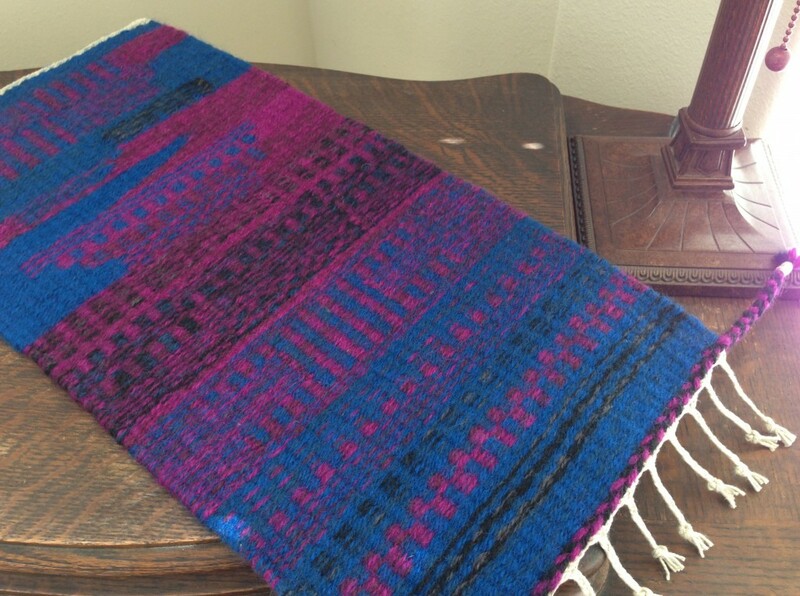 The first weaving I saw was an elderly lady “Aunt Sally”. She wove on a barn loom. I bet that is what the lady used to weave your grandmothers rugs. Aunt Sally lived to be 106 and wove some on the day she died. I would love to have met “Aunt Sally.” I expect you are right, my grandmother’s friend was probably someone just like that with an old barn loom. Oh, I’d love to be an elderly someone who is said to have woven on her loom the day she died. 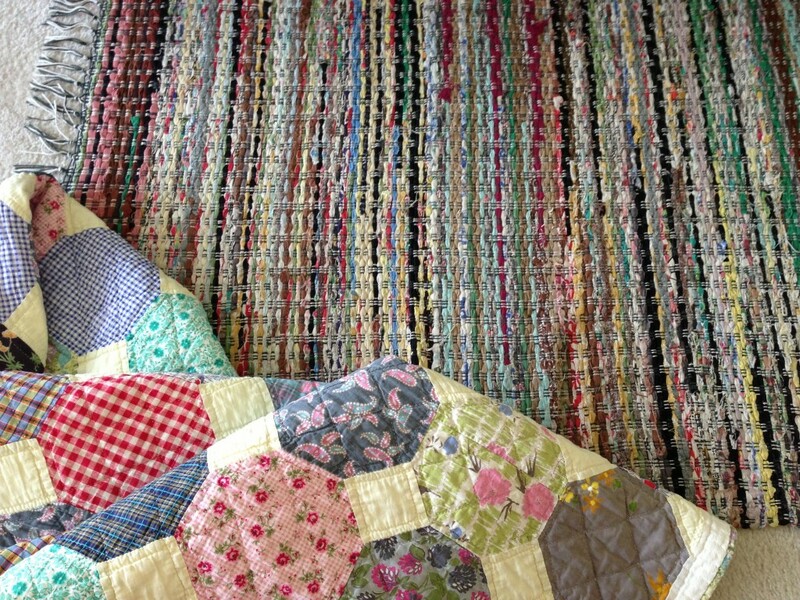 Beautiful rag rugs and quilt! I grew up with rag rugs and I love the concept of reusing materials. Maybe we need to keep our clothes until they wear out. What intrigues me the most is that despite the limited selection of materials they had access to, the result is so powerful. To me this is such a strong reminder that what may seem worthless and weak contributes to beauty and strength in a bigger picture. Great insight, Elizabeth! I agree, the limited selection of materials certainly didn’t limit the beauty of design, which was also entirely functional. Oh how fun to hear your story, Heather! Yes, it does sound like our grandmothers had some similarities! That’s cool that the “rug lady” took time to show you what she was doing. Thanks for sharing! What is your usual sett for your rag rugs? And when you lay two pieces together, do you fold one inside the other? I have always sewn my pieces together but is makes the process so much longer. I’d love to skip that step. You have a wonderful eye for color. My sett for rag rugs is 8 ends per inch. I cut the ends of my fabric strips into tapered ends – about 2-3-inch taper. I overlap the tapered ends in the shed. Because the ends have a long, narrow taper, there is no need to fold one inside the other. 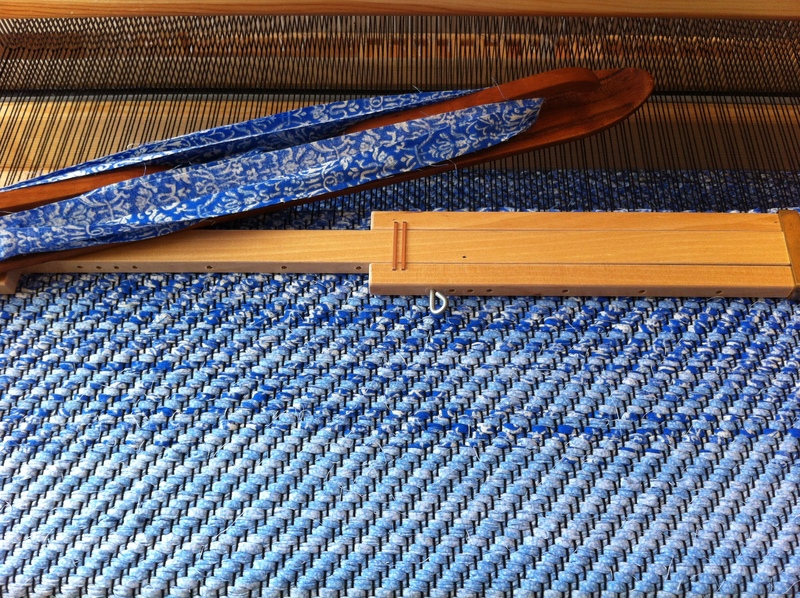 Overlapping the tapered ends makes a sturdy, almost invisible join, with no bump or bulge in the weaving. I wish I lived close enough to take lessons from you. Your skills and your beliefs would be such a pleasure to absorb. I am still looking for a floor loom and a band loom (the new ones, in addition to more money, do not appear as sturdy). In the meantime I am learning. How wide do you cut your cloth strips? I would think fabric weight would be a factor, but still how do you decided? If you are ever near Houston, let me know. I’d love to spend time together. That would be delightful! The Glimakra countermarch floor looms that are new are just as sturdy as the old ones. I have a new one and an old one. There is a slight change in the band loom, though. The older ones, like mine, have metal ratchets. I’ve been told that the new ones work just as well, though. But you are right, the new looms are more expensive. I bought my big loom new because I wanted to make sure I wasn’t inheriting anyone else’s problems. I normally cut my fabric strips about 3/4-inch wide, except for the ones I use in the hem, where I cut them about 1/4-1/3-inch wide. I have found that the weight of the fabric doesn’t really make that much difference in the final outcome, as long as the differences are distributed fairly evenly as you go. To simplify, I cut all my fabric strips the same width. 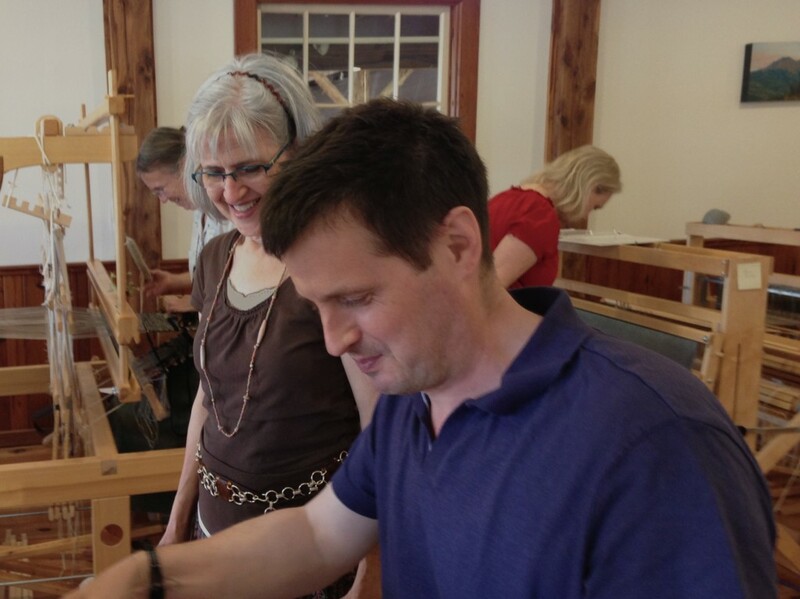 Sorry to take your time from weaving, but I really appreciate your advice! Thank you for the invite! I think I need to actually get to weaving so I can have a better understanding of what I’m being taught. Thank you also for the loom evaluation. I had not thought of inheriting other’s problems! Glimakras must be enjoyable looms as I don’t see many used ones listed. And, thank you for the cutting information. One thing I forgot to ask is how do you know you have enough cloth for a rug? Ask away. I’m happy to answer questions. How much fabric for a rug? Good question. Haha. I’m still trying to figure that out. My method is guess and hope it’s enough. Usually, that has worked for me. I need to get better at record keeping for my rug materials. I do buy new 100% cotton fabric in 5-yard lengths – I like weaving with long strips because it’s much more efficient than using short strips. I find bargain fabric on clearance at fabric stores or at Walmart. I’m at the point where I have a small collection of fabric in different colors to choose from, and I just add to it little by little as needed. Great idea! I’ll try that. Finally! The Swedish lace curtains are hung…Yippee! However,…I came really, really close to cutting the finished material in the wrong place, about eight inches too short. Gasp! I had sewn the top casing and ruffle, and had carefully measured for the placement of the hem. But in my enthusiasm to finish, I got confused when it came to the final cut. Fortunately, I decided to put my scissors down and measure one. more. time. Catastrophe avoided! 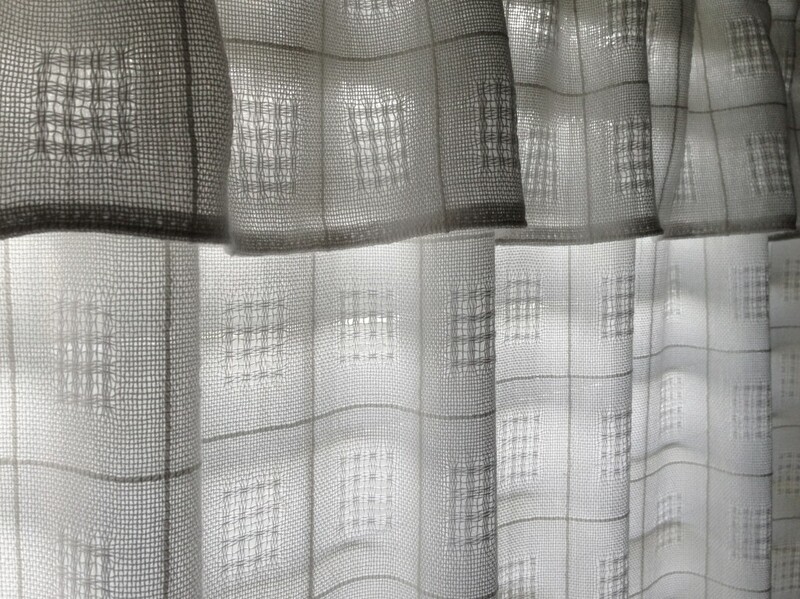 Swedish lace curtains, at their best when sunlight shines through. Decisions come every day, big and small. How do you make decisions? Luck, make a guess, have a feeling? Luck isn’t dependable, guessing is risky, and feelings change with the weather. Like my near mishap with the curtain fabric, we could be one decision away from a huge mistake. If we pay attention, Lady Wisdom’s invitation is heard at every decision point. We face decisions that are far more important than where to cut the fabric. There are plans for the future, and crossroads in life, as well as daily choices. Wisdom creates building blocks for future decisions. One wise decision leads to another, and then another. And before you know it, you have sunlight streaming through the fabric you’ve created. If you are interested in how the fabric was made for these curtains, you may enjoy this post, and other posts in the category, yardage: curtains. May your decisions be secured through wisdom. So true! And I’m so thankful for God’s grace when I mess up. The curtains are beautiful. Where did you hang them? The curtains are hanging in the two long, narrow windows at each end of the front of our house. Both are “personal” spaces that we use every day – the window in our bedroom closet, and the window in the laundry room. God’s grace is essential, because we all make serious mistakes. Yes, I’m thankful for grace, too. What a beautiful, tangible reminder to take time to listen before I plow ahead with what I think seems right…. Taking time to be still isn’t easy when we’re eager to get things done, is it? I’m so glad, that you lay down your scissors. Your curtains are beautiful. Me, too, Grethe! I think it’s a lesson I will remember for a long time. Thanks for the compliment! Oh, Karen the curtains are absolutely gorgeous! I really enjoyed the post about almost making a huge mistake with the scissors. I can really relate, having done things like this many times. Years ago, a really wise person taught me to think aboout these kinds of occurances not as mistakes, but as an oppurtunity to thank our minds for doing the right thing. Gorgeous curtains! The subtle pattern is just beautiful. Don’t you think the process of making beautiful things better prepares us to pause and listen to to “Lady Wisdom”? As you know, I recently experienced how important it is to stop for a moment and listen in order to make the right decision. Your post just reinforced this message. And I am already experiencing that one wise decision leads to another. And I’m very grateful, Elizabeth, that you did hear wisdom for that critical decision! Your curtains are fabulous. And I like your reflection om decisions… I usually make decisions very fast, am focused on problem solving. But with age I’ve come to reflect more often. Stop, before I make up my mind, listen, see what happens. It’s a new experience that includes learning. I think that’s one of the reasons why weaving is so good to me, I cannot rush. That is so good 🙂 Enjoy your wonderful curtains. I appreciate your kind comments so much, Iréne. It’s fun to end up with something useful and lovely to look at. You and Elizabeth make a great point, that weaving (or knitting, quilting, wood carving…, making beautiful things) does give us a wonderful opportunity to be comfortable with going slow. A lot of thinking is required. It is a constant learning environment where we are actively paying attention to what our hands are doing.